Fleetwood Mac, the first band I ever loved. "The Dance" album came out when I was a sophomore in high school and let me tell ya, they knocked me out my shell man. Fleetwood Mac is on the same level as Goo to me. So here is a very brief little bio thingy for those unknown to the power that is the Mac. The band was originally made up of Mick Fleetwood, John McVie, and Peter Green. They released some records. Green left, John McVie married Christine Perfect, who then became Christine McVie and later joined Fleetwood Mac. They released some albums. Mick heard a man by the name of Lindsey Buckingham jamming on his guitar on his album with his then girlfriend Stevie Nicks; the name of the album "Buckingham Nicks," wonder where they came up with that? The Mac asked Lindsey to join and Lindsey basically said that he and Stevie were a package deal. Now is that a great boyfriend or what? :) So on New Year's Eve, 1974, the Fleetwood Mac we know today was born. 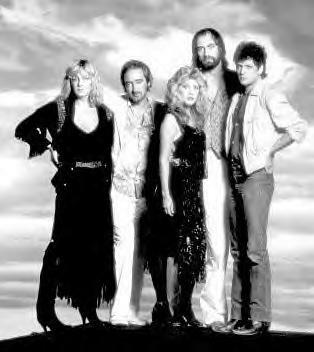 They released Rumours in 1977, without Stevie's "Silver Springs." The 6 and some odd minutes song was too long and Stevie refused to shorten it; it was replaced with "I Don't Wanna Know." Unbeknownst to them all, "Silver Springs" would later become a hit. Rumours went to number one and stayed there for 6 months, earning them a Grammy for Album of the Year and became one of the best selling albums of all time. They released some more albums, broke up, got back together and then "The Dance" was released in 1997. "Silver Springs" was added to the album finally and became a hit; which MandyMay played on repeat for months, much like I did "Black Balloon;" they were nominated for multiple Grammy's and the rest is history. Now, how does Fleetwood Mac tie in with the Goo Goo Dolls you ask? Well, here are two reasons. 1.) On Fleetwood Mac's double album "Tusk," Christine McVie wrote and sang a song called, "Think About Me." On Goo's album Gutterflower, Rzeznik wrote a sang a song called, "Think About Me." 2.) The Goo Goo Dolls did a cover of "I Don't Wanna Know," on the Rumour's Tribute album. Here is what Mike had to say on recording "I Don't Wanna Know." "We didn't really rehearse it. We listened to it, played it a couple of times, and then decided not to do anything with it until we could meet with a producer. It was Lou Giordano who produced that song. He came into Buffalo. `OK, Lou, we don't know what we're doing. We know the arrangements of the song, but let's change it.' And we started messing with it. It sounded really hokey. The chord progression is so straightforward that no matter how we played it, it sounded dumb. We just started trying all this different stuff. Finally I just said to Johnny, `Man, why don't you go in there and write a song?' So Robby and I left the room. Johnny went in there with the producer and wrote a song in 20 minutes and sung the Fleetwood Mac lyrics over it. So it ended up that the chords were completely different, but the vocal melody is pretty much the same. It sounds like a Goo Goo Dolls song with Stevie Nicks lyrics"
Were these two incidents mere coincidences? I think not. These are just two very good reasons for MandyMay to be completely convinced that she was destined to love both of these bands. MandyMay's Concert Review: Finally, I have made it to my very first Fleetwood Mac concert and probably last. Nashville, Tennessee May 31, 2003. While the entire group was not in attendance, the concert rocked. . .just like it was meant to. Click on the Say You Will CD art for a review.